Ben offered all his unparalleled experience to find the trout, the strategy for approach, the techniques of fly casting, capture and safe and healthy return of the fish to the river. His dedication to fly fishing, experience, teaching, patience and gentle attention resulted in a fantastic trip. My fishing experience was one of the best days of fishing I’ve ever had, and definitely a highlight of my trip to New Zealand. I would highly recommend Ben to anyone looking to spend a wonderful day on the water catching beautiful (and big) fish in a wonderful location. Ben was tireless in his search for fish, always willing to tie on a new fly or change strategies, and was a great companion for the day. His wife also packs a great shore lunch, which was welcome after a morning of fighting big trout. If I’m lucky enough to make it back to New Zealand, I’ll be sure to spend another day on the water with Ben. I hired 3 different guides during my New Zealand fly fishing adventure. Ben was the best of all of them. He is knowledgeable, patient and very skilful. He organises everything so well for you that you will definitely enjoy the fly fishing trip. 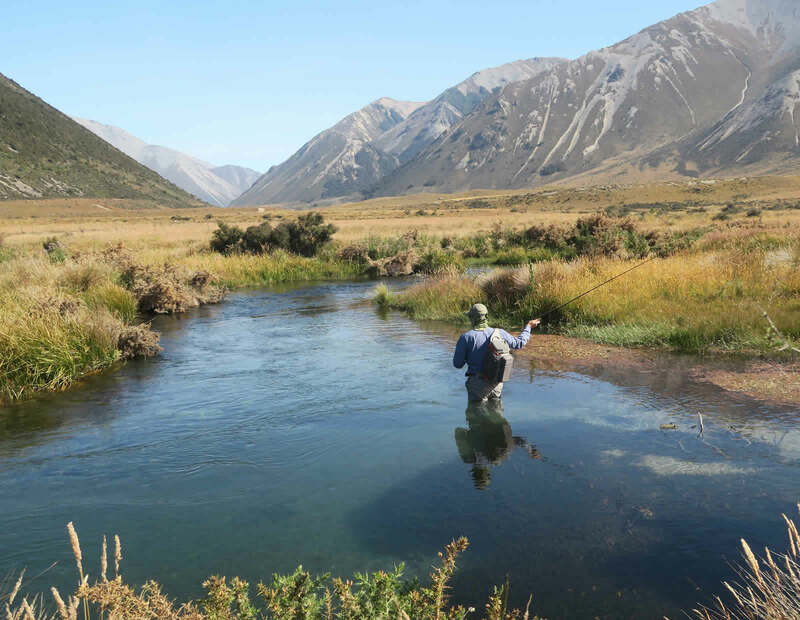 He will take you out on the best streams of Southern New Zealand. He will share his knowledge and you will definitely catch some very large trout. I had a great time fishing with Ben. Highly recommended! Ben is an awesome guide and person to go fishing with during my honeymoon in NZ. He is a guide who is passionate about his work and his knowledge about the area and techniques were top notch. Everything was taken care of from start to finish. All high quality gear and tackle was supplied along with a great boxed lunch. Ben knew where all the best spots were for where we could fish for some giant trout. Trout were caught in excess of 10lbs. Bigger than what we could catch in Southern California by a mile. We will definitely hire Ben for our next visit to NZ. Thank you Ben for the great talks and a memorable fishing trip! Ben is a brilliant guide. I spent a great day walking a high country stream with him. He seemed to know every twist, turn and pool. We saw and caught some of the biggest fish I have seen. A really nice bloke who goes out of his way to make sure everything is perfect. Fishing with Ben was the highlight of my 3 week trip to New Zealand. Ben was there 20 minutes early to pick me up. It was a 45 minute drive to where we started fishing. Gorgeous scenery throughout the fishing experience. We hiked into a gorge and fished 3 different rivers. Fish were plentiful, caught several and had fun. Ben knows the hot spots and when the fish were not taking one fly, he knew what fly to switch to. He is very safety conscience, carried medical supplies and an evac phone in case of an emergency. Even this 70 year old fisherman could not have found a better fishing guide and partner anywhere. This was my third trip with Ben, that says it all. He finds fish where I can only see rocks. He knows I like challenging, hard and long days on the river. My legs and I are never disappointed. Excellent guiding! I will be back again.